Why Choose a Fabric Display? Printed tension fabric displays, used for Exhibition Stands and retail displays, have dramatically increased in popularity since 2014. The UK exhibition market has been initially slow to adopt fabric as a display media, despite impressive improvements in the hardware, inks and printers that are now available. Europe was an early adopter of Fabric Displays, mainly due to their existing expertise in fabric and garment printing. Italy’s primary export is textiles - fabric, dyed or direct printed fabric for the fashion and clothing market, so it is apparent why they should lead the display revolution for tension fabric displays. The exhibition market in the UK has now firmly adopted direct fabric displays, or TEXStyle as it is also called, and with emerging technologies we are leading the way with tension fabric display solutions that give customers innovate display stands for their marketing and exhibition requirements. There will always be high demand for the more traditional PVC and vinyl exhibition stands and despite what some companies may like you to believe, the Pop Up Stand with replaceable graphic panels is far from dead but fabrics do have some distinct advantages over other printed media. Textile and fabric display printing is the process of applying ink to a stretchable ‘tension’ display polyester for use on exhibition stands. The ink can either be applied directly to the fabric (known as dye sublimation) or to a transfer paper, which is then applied to the fabric via a calendar process. Traditionally, dye sublimation never gave as good print quality as transferred print – ink splatter and ‘bleed’ are two obvious problems with poor print quality. Today, with new print technologies available, direct fabric printing now gives as good (some say better!) print quality with quicker production times and removes the need for a separate calendar unit – meaning lower print costs and faster production times. That means customer benefit through lower cost and better market competition. This is the process we use for our fabric displays. So what else makes fabric and textile display printing an exciting innovation in the exhibition display market and what can it do for your business? What fabric has to offer? Fabric offers a fresh, new and exciting alternative to more traditional Exhibition Stand Displays. There are many benefits to adding a fabric display to your exhibition kit – you get the chance to really stand out. Exhibition halls are usually filled with pop up after pop up and pull up banners too. It’s often the same product on each stand with only a different design to differentiate them. A fabric display will give you the chance to shine and own the show and it can be a real focus point to get people talking. The vibrant, fresh, new look is exactly what your brand needs, especially if you are a regular exhibitor. In order to be successful you need to be doing something different to impress your client base. Your competitors certainly will. Fabric allows you to mix it up. Fabric displays have high quality print so your design will not lose out and as the design is printed onto fabric there are no panel joins, like on a traditional pop up stand. We believe fabric displays have increased in popularity due to superior portability in comparison to traditional pop up displays that use PVC print media. With a standard pop up you have the frame plus a number of graphic panels that need to be carefully rolled up and packed away in a large, rigid carry case. However, with display polyester your graphic is an all in one fabric sock which can be folded down to fit in much smaller bags or carry cases. 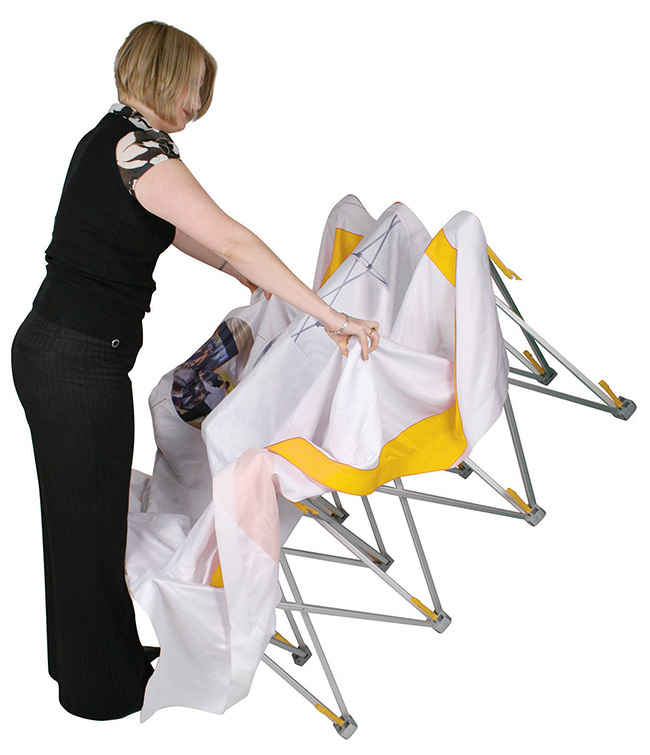 Transporting your fabric display is much easier than a large traditional pop up display. The weight of the fabric display is much less so it is a far more cost effective system to have as your exhibition stand, especially if you have to factor in shipping costs into your budget. Shipping internationally will prove to be more beneficial with a lightweight fabric display. In addition to being a more lightweight display they are also more durable. This is because the fabric sock that covers your aluminium frame is scratch and crease resistant. You can fold up your material without the worry of it looking less than perfect for your next show. The tension fabric system means the fabric will be stretched over the aluminium frame leaving a seamless, crease-free fabric graphic. Fabric displays are also machine washable so they are much easier to keep in the pristine condition required to really wow visitors at your exhibition stand. PVC media can be wiped clean but it does not always return to the original condition, it can be scratched and creased therefore making it slightly less durable than the up and coming fabric display. Fabric display stands we offer are extremely easy to assemble and can be set up in minutes by one person. On the Hop Up Display Stand, for example, the graphics and locking arms are attached to the frame so it simply unfolds and locks into place, taking only minutes to set up. It is easy to store and transport as the frame unlocks, folds down with the graphics in situ and fits into the carry case provided. The Formulate Displays are much the same with a lightweight aluminium frame that is quick and easy to assemble. The fabric graphic sock fits snugly over the frame leaving your with a seamless display back wall. Both of these popular displays require no tools for assembly, meaning less to transport to and from your show. Our Hop Up and Formulate Tension Fabric Displays offer you the choice of various sizes and configurations. You can have a double sided printed fabric sock which gives you a greater display area and allows you to target foot traffic from all angles. The Pegasus Fabric Banner has fully adjustable telescopic poles which allow you to reduce or expand the size of the banner. Our fabric display range is ideal for if you require a large display area. To view our full range of products, visit our Fabric Display Stands page. At XL Displays we believe in the longevity and durability of our fabric display stands and we see that the requirements of the exhibition industry are changing. We are experts in exhibition stands and portable display equipment. For advice and more information on how we can help you prepare for your next event, please Contact Us or call us on 01733 511030.